The equity markets have been very quiet of late. Even though the equity markets made marginal new highs last week, they have spent most of this Cycle trying to break above the high set on Day 13. 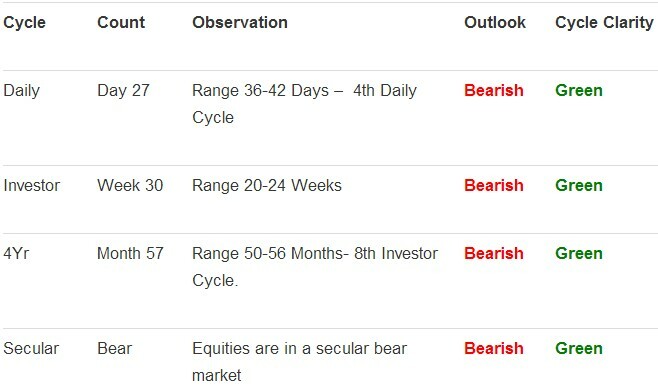 Within that period, they have repeatedly been rejected, which the bears will argue is part of a Daily Cycle topping process. But the trend is up and consolidation zones are typically a pause before a continuation of the primary trend. The bears had a couple of good opportunities to pull the market down, but in each case the dips were bought. This battle has resulted in a very narrow trading range as both sides defend their respective lines. 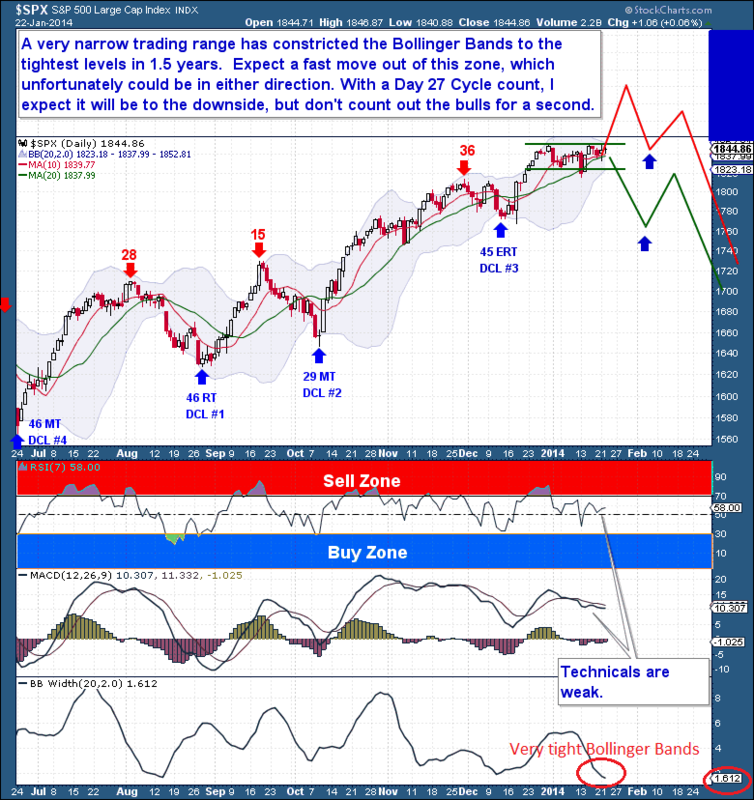 As each day has passed, we’ve seen a further constriction of the Bollinger Bands. Looking back, they’re now at their tightest levels in 1.5 years. In almost every case, across all assets, very tight bands results in a significant expansion in price and volatility. The problem for traders is with knowing the direction of the coming move. Beyond the scope of this service, a trader (for example) could well play for the coming volatility, regardless of direction. The arguments for either move are compelling, but unfortunately only one can prevail. Being this is already Day 28 of a stretched Investor Cycle, my primary expectation would be for a move to the downside. But it lacks conviction because over the past 2 years, for the most part, we’ve seen these situations resolve upwards. I understand this is not a definitive prediction, but the evidence is simply too conflicting to put complete weight behind one of these scenarios.